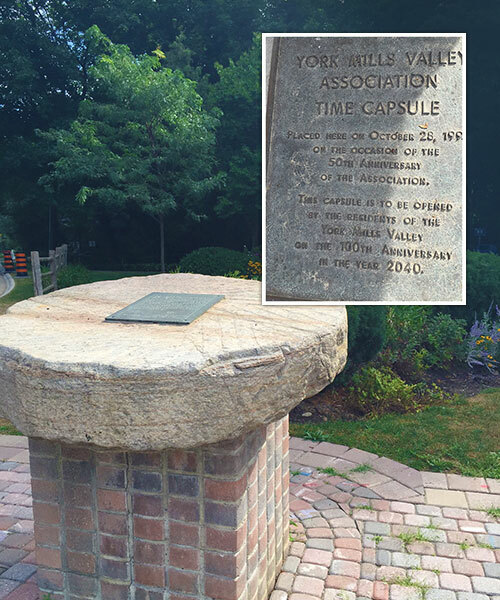 In 1794 Thomas Mercer, an immigrant from Pennsylvania was the first to settle in the York Mills Valley. The Mercers were United Empire Loyalists and were granted a tract of land, south of York Mills, extending from Yonge to Bayview. The village of York Mills developed in this area around three mill sites on the Don River. These mills attracted farmers from outlying districts who travelled to York Mills to have their grain ground and their wood cut. Farmers were happy to have any inferior quality grain used to make whiskey at the local distillery adjacent to the grist mill. York Mills grew steadily because it was so well situated on the main trading route between York (Toronto) and settled areas north to Lake Simcoe. Much of the area was too swampy for farming. The Village however developed because the Don River was natural site for industry. By 1856 when J and W Hogg advertised land for sale in a sub-division called “Hogg’s Hollow”, it was a prosperous community. The area also attracted many of the subsidiary trades – blacksmith, wagonmaker, cobbler, barrel-maker (or cooper) as well as a tannery. The period 1850 to 1880 was a busy one for the village on the Don. The numerous mills did a thriving business. Villagers could hear the sound of water rushing over the water wheels, the whine of saws cutting logs and the low rumble of stones grinding grain. By the end of the 19th century the milling industry declined when the railroad went through. The last mill in the valley was Pratt’s which ceased operation in 1926. As the 20th century dawned, the valley began to develop as a residential area, retaining however its village atmosphere. The large piece of property that the Boultbee family purchased in 1909, encompassing much of the valley, was split off gradually sold for subdivisions. A few houses were built in the 1920’s and then a building boom took place between 1933 and the beginning of World War II. After the war construction began again and the valley was gradually developed. The valley has long been a much sought after place to live. Enclosed by steep green hillsides and parkland, with the river meandering through, the hollow has a special sense of community. The historic and contemporary sit side by side in a rural atmosphere – bungalows stand comfortably next to imposing larger homes. This mix style produces stimulating streetscape that brings out many walkers in the area. The historical, architectural and geographic richness of our valley is a special legacy. It will take continued vigilance by the community to preserve its integrity against the rising tide of development.